The Red Sox completed a three-game sweep of the Toronto Blue Jays with an 8-4 win Wednesday afternoon at Fenway Park. 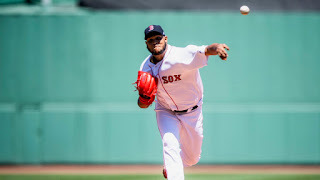 Eduardo Rodriguez was very impressive - perfect through the first 4.1 innings when he allowed a single to Kendrys Morales. He ultimately went 6.2 innings, charged with two runs on three hits and just one walk. He struck out seven and improved his record to 6-1. Andrew Benintendi and Jackie Bradley Jr. bookended the Boston lineup with two hits apiece. Eduardo Nunez and J.D. Martinez each homered for the Red Sox. For Martinez, it was his MLB-leading 18th home run of the year. Martinez has hit 13 home runs in May, the most in a single month since David Ortiz launched 14 in July 2006. Blake Swihart made his first career start at first base and collected a pair of hits. Boston heads to Houston for a four-game weekend series with the Astros.